If you enjoy this article and want to demonstrate your learning, you can do so by taking the BJFM breast cancer challenge at the bottom of the page. Breast cancer is the most common cancer in women in the UK with over 50,000 new cases diagnosed each year. For women at average risk in the UK, the background lifetime risk of developing breast cancer is 1 in 8.1 Genetic factors increase this risk. It is the second most common cause of cancer death in women after lung cancer.2 Despite this, most are diagnosed at an early stage and survival rates have doubled over the last 40 years. Breast cancer may occur in men, with around 350 new diagnoses each year in the UK.3 Age is a major risk factor with 80% of all new diagnoses occurring over the age of 50.1 Despite this, it is important to remember that 20% of breast malignancies occur in women below this age.4 Younger patients may have different concerns, particularly around fertility and it is important that GPs ensure that such concerns are being addressed. Modifiable risk factors need to be taken into account when counselling women about their risk of developing breast cancer. Obesity is thought to be linked to 9% of breast cancers in the UK and alcohol consumption to around 6%.1 Protective factors include breast feeding and physical activity. Although most women are aware that a lump can be a sign of breast cancer, awareness of other potential signs and symptoms among the public are poor. There is evidence that awareness is less among some ethnic groups including South Asian and Black women,5 and also in the over 70s. The National Breast Screening programme in England invites all women between the ages of 50 and 70 for a 3-yearly mammogram. Around 4% of women will be called back for a more detailed assessment, but only one fifth of these women will subsequently be diagnosed with breast cancer.6 The age range eligibility has been extended in some parts of England from 47 to 73. Women over 70 may self-refer for continued 3-yearly mammograms. Ductal carcinoma in situ (DCIS) and lobular carcinoma in situ (LCIS) are recognised as early forms of breast cancer and may be detected by screening. Management is controversial as it does not always lead to clinically significant disease. There is therefore a risk of over-diagnosis of cancers that would never have become clinically significant, the diagnosis and treatment of which may cause physical and psychological harm. Other potential harms include false positive or negative results, and the risks of radiation. An independent review of the benefits and potential harms of breast cancer screening found that those screened had a 20% relative (not absolute) risk reduction in death from breast cancer compared to those unscreened. It is estimated that for every 10,000 women invited for screening over the next 20 years, 43 deaths would be prevented but there would be 129 cancers over-diagnosed.7 Information that is sent out to women with their screening invitation now includes details about the risk and potential harms of overdiagnosis. Alongside a breast lump there are other presenting symptoms and signs listed below. Approximately 5% of all new breast cancers arise in women with an inherited genetic risk.2 The main genes involved are BRCA1, BRCA2 and TP53. Family histories which suggest a risk of an inherited breast cancer gene include multiple (especially first degree) relatives with a diagnosis of breast or ovarian cancer, a first degree male relative diagnosed with a breast cancer, a first degree relative diagnosed with bilateral breast cancer below the age of 50 years or at least one first degree relative diagnosed with breast cancer below 40 years of age. Surgical treatment, often as a day case, remains the mainstay of curative therapy for early breast cancer. Wherever possible the breast is conserved with a wide local excision procedure. After axillary surgery patients are counselled to avoid ‘injury’ (even something as benign as a blood pressure measurement) to the arm to minimise the risk of lymphoedema. Sentinel node biopsy (removing a minimal number of axillary nodes) has reduced incidence of pain, lymphoedema and restricted shoulder movements. For larger tumours, neoadjuvant therapy prior to surgery (chemotherapy) may be used in order to avoid mastectomy. When mastectomy is necessary, multiple reconstruction options are now possible. There is concern that the number of women requesting prophylactic mastectomy (and contralateral mastectomy for risk reduction) is rising. Numbers of bilateral mastectomy nearly doubled over the last decade.8 This rise is partly explained by increased screening for genetic risk. 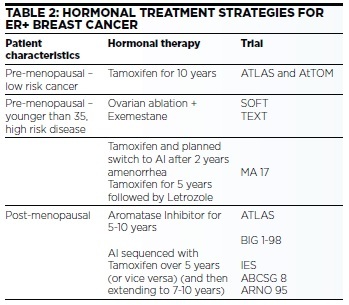 All four modalities of adjuvant therapies (radiation, chemotherapy, hormonal therapies and biological/targeted therapies) are in routine use in breast cancer treatment. Systemic breast cancer recurrence risk (and therefore mortality) is reduced by chemotherapy. Chemotherapy regimens vary but currently all use intravenous therapy. These drugs can damage peripheral vessels and phlebitis is common. Central venous access devices (CVAD) are therefore commonly recommended. Peripherally Inserted Central Catheters (PICC lines) are relatively easy to place and remove but implanted Portacaths (requiring a short operation to insert/remove) may be favoured due to lower infection rates. 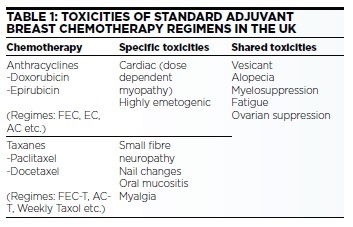 Chemotherapy protocols are based on the anthracycline and taxane drug classes. These drugs have overlapping toxicities, so are usually given sequentially rather than together. Treatments are usually given in a 3-week cycle, determined by the recovery from myelosuppression. A course of chemotherapy may be as short as four cycles (in patients with node negative disease), and as long as four cycles of 3-weekly anthracyclines followed by 12 weekly doses of paclitaxel for high risk disease. Alopecia is a universal complication of standard adjuvant chemotherapies. Hair loss occurs quickly and includes body hair (including nasal hair resulting in rhinitis and epistaxis). Hair loss can be reduced by the use of scalp cooling during treatment. After chemotherapy hair grows back at the same rate as pre-treatment but the initial growth phase may be associated with a ‘chemo curl’. Myelosuppression is a common side effect of chemotherapy and may lead to serious infection. Neutropenic fever is triaged as a medical emergency as patients may become septic and critically ill quickly. Patients should be educated by their chemotherapy provider on signs and symptoms and be given 24-hour contacts. Patients who consult primary care with fever during chemotherapy should be immediately directed towards their chemotherapy unit. Vomiting has become a relatively rare event with modern anti-emetics. 5HT3 inhibitors such as ondansetron have been incorporated into most protocols. These therapies are frequently constipating and co prescription of aperients is usually recommended. Patients may receive all attenuated vaccines during adjuvant chemotherapy and are recommended to have the influenza vaccination. Breast cancer will cause predictable ovarian suppression that threatens future fertility and can cause premature ovarian failure/menopause. Pre-menopausal women should be counselled and referred to fertility services when necessary. Many women will become amenorrhoeic during chemotherapy. FSH levels may be in a postmenopausal range, although ovarian function may recover within 18 months of therapy end. Fatigue is a cumulative effect of chemotherapy. Exercise has been shown to improve quality of life and reduce treatment related fatigue. Exercise initiatives including the Macmillan ‘Move More’ programme should be promoted during treatment with a clear message that ‘rest is not best’. Ability to work is affected by fatigue, nausea and schedule of treatment. Approximately 15-20% of breast cancers over-express the growth factor receptor Her2. Adjuvant therapy includes the monoclonal antibody Trastuzumab. Trastuzumab is prescribed for one year on a three weekly schedule and is given as a 5-minute subcutaneous injection. It is well tolerated with minimal impact on quality of life, but may cause reversible cardiac damage (with ventricular dysfunction that responds well to ACE inhibitors) in small numbers. Cardiac monitoring by echocardiography is mandatory before treatment and periodically during therapy. Dose dependent cardiotoxicity may also be seen with the anthracyclines. Approximately 80% of breast cancers are oestrogen receptor positive (ER+). Oestrogen manipulation remains a cornerstone of adjuvant therapy albeit with potential impact on quality of life. Multiple strategies are possible (Table 2). In post menopausal women the aromatase inhibitors (AIs); anastrozole, letrozole and exemestane are marginally more effective than Tamoxifen. In perimenopausal women they may induce a paradoxical return to menses and should be avoided. By reducing women from a ‘low oestrogen’ to a ‘no oestrogen’ state they can cause significant vaginal dryness and arthralgia as well as accelerating post menopausal bone loss (see Table 3). 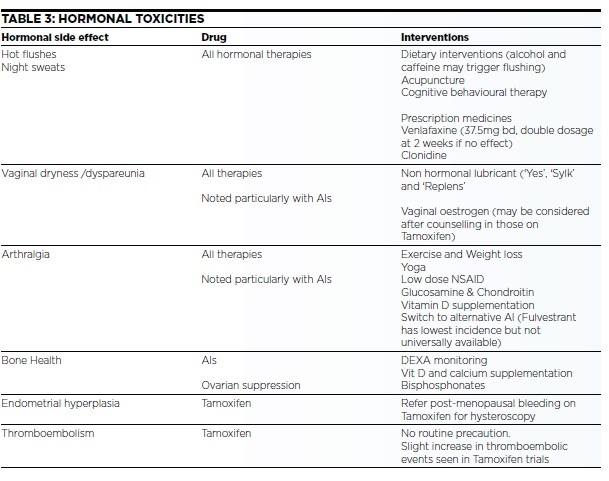 Side effects of endocrine therapies (see Table 3) must be carefully considered. Non-compliance rates are high particularly due to menopausal side effects and arthralgia. Bisphosphonates reduce the risk of breast cancer relapse in those women post-menopausal at diagnosis. There is a preference for intravenous zoledronic acid due to high compliance although oral bisphosphonates prescribed in primary care can be effective. The ‘routine’ follow up of patients with early breast cancer has not been show to improve survival outcomes nor does it detect recurrent disease any quicker than patients in a self-surveillance scheme. Annual mammography is recommended, but there is no requirement for any other imaging. The treatment of breast cancer has improved through multiple advances in surgery and adjuvant treatments. These developments significantly reduce the chance of acancer recurrence or death, but burden the patient with multiple treatments that are increasingly complex and sometimes protracted. Supporting the patient through this and minimising treatment toxicities continues to challenge. 1) Breast cancer is the most common form of cancer in women in the UK, but how many new cases are diagnosed each year? 2) How frequently should women between the ages of 50 and 70 be invited for a mammogram? 3) Modern anti-emetics have largely removed which side-effect from treatment? Genetics can play a role in the development of breast cancer in what percentage of cases? 9. Eur J Cancer. 2014 Sep;50(14):2375-89. doi: 10.1016/j.ejca.2014.06.007. Epub 2014 Jul 24. 12. Lancet. 2013 Mar 9; 381(9869): 805–816. 13. New England Journal of Medicine, 2015. 372(5): p. 436-446. In the second part of this series we will consider living beyond cancer treatment in more detail as well as symptom control issues in advanced disease.